Back in January, Roger wrote one of his saddest blog entries. It was about the death of Hadiya Pendleton, the 15-year-old honor student in Chicago who was shot randomly by gang members while she and her friends took cover from rain in a South Side park. "I'm all out of arguments," Roger wrote, sounding as full of despair as I'd ever seen him. Though Hadiya's death brought national attention to the escalating violence in Chicago, all the handwringing hardly curbed the problem. This summer has been dominated with reports of gunfire and rising homicide rates in this city. In one August weekend alone, six people were killed and 27 others wounded from gun violence, including a 7-year-old boy shot while walking his bicycle up the steps of his home. Amid such relentless bad news, one group has been trying to bring some positivity and uplift to many of these same hard-hit communities in its own, unique way. All summer long, the nonprofit Redmoon Theater has been offering a series of free drum and poetry workshops in South and West Side parks, accompanied by its trademark performance spectacles. That series, which the Ebert Foundation has helped support, culminates this Saturday, Sept. 7, with the final event in Humboldt Park. The activities will kick off at 4:30 p.m. with workshops held in collaboration with Chicago's Bucket Boys drum corps and poets from Young Chicago Authors. 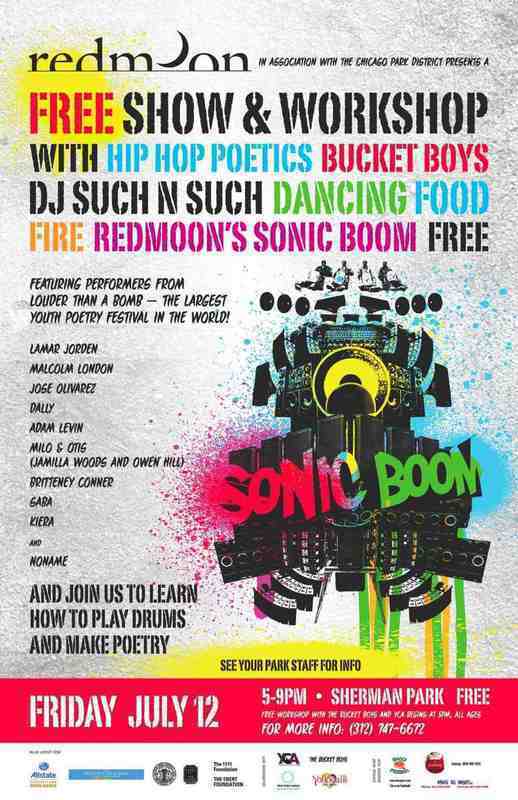 Participants are then invited to parade through the park alongside Redmoon's Sonic Boom, a massive 16-foot mobile boom box. The parade leads into what the organizers describe as a "community celebration that is a mash-up of music by DJ LMS, spoken-word poetry, drumming, dancing, and a free meal of pizza and fried chicken." If you have never witnessed a Redmoon performance, they are a sight to behold. The group might show up at a high-profile public space like the Daley Plaza with a mobile, 27-foot ladder supporting an acrobat performing high above surprised passers-by. Somewhere else it might show up with a sound system that allows a DJ to spit out fire or some other highly engineered contraption. Always breathtaking, always mesmerizing, the performances are meant to jar the unsuspecting audience out of its complacency. Redmoon producing artistic director Frank Magueri described the group's philosophy to me this way: "We create momentary celebrations that have long lasting effect on the people and the spaces. These kinds of celebrations leave a residue at that space about how it can be perceived and engaged differently." Redmoon calls these outdoor performances "urban interventions." And never has that description been more relevant than with the group's summer park series. If these events can get South and West Side Chicagoans to think about their parks not as gang turf but as community gathering places, if they can lead even one troubled teenager to express his or her frustrations through spoken-word poetry rather than through violence, then they have succeeded mightily. Once the summer park series ends, Redmoon will move indoors to a new 57,000-square-foot warehouse space in the Pilsen neighborhood. The group will hold a series of large-scale events there from October through April, featuring fire performers, acrobats, and the like. (For specifics, check out the theater's website at redmoon.org.) These indoor events aren't free – they range from $20 to $100 per ticket – but that money helps support the summer events. In other words, by attending a winter show you're essentially becoming a philanthropist. And what a worthwhile cause it is. Roger ended his blog about Hadiya's shooting with a provocative question: "What could we as a society have done to prevent it from happening?" Perhaps the answer doesn't lie with any one sweeping fix, but rather a series of meaningful measures to reclaim our neighborhoods and parks. Redmoon's summer series is a wonderful place to start.